who doesn’t want pearly whites? strawberries – mash up a couple ripe strawberries, and apply them to your teeth as a paste. you can also brush your teeth with the berry paste instead. the astringent in strawberries helps remove surface stains, and the vitamin C whitens teeth by clearing away plaque. make sure you rinse well with water after and/or brush your teeth after to clear off the acid. unrefined coconut oil – put a toothpaste-sized amount on your toothbrush and brush for a few minutes. rinse and done! the oil will help promote a healthy oral environment, leading to healthier gums and whiter teeth. other fruits & veggies – crunchy vegetables such as raw celery and carrots, and crispy fruits like raw apples and pears are naturally abrasive, not to mention full of nutritional goodness. they’re great for teeth and your body! baking soda – under no circumstances should you be using a baking soda paste on your teeth to whiten them! it’s abrasive and WILL erode your enamel! lemon/orange juice/peel and/or apple cider vinegar – the acid will erode your enamel over time when used as whitening agents. hydrogen peroxide – it’s rough on your gums and the lining of your mouth, disrupting the normal flora of bacteria in your mouth. also, HP is an oxidant. think of it this way: you use antioxidants to reduce cellular damage, so why use an oxidant in your mouth? 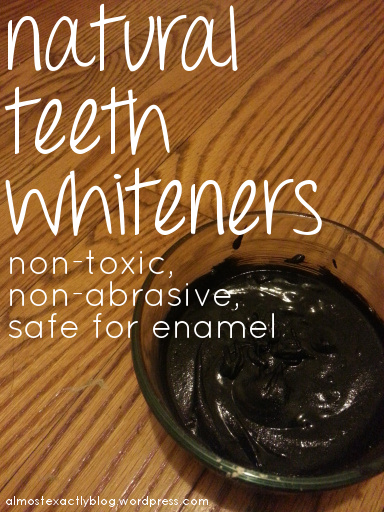 so long story short, do Not use it to whiten your teeth! has anyone tried any of these? what are your favorites?? i personally love activated charcoal mixed with enough unrefined CO to make a thick paste 🙂 not to mention my homemade toothpowder has AC in it anyway! I had very yellow stained teeth from smoking and drinking coffee. I tried the baking soda peroxide and coconut oil it helped but not as much as I thought . Then just coconut oil and regular toothpaste. I continued to search for the activated charcoal. I picked that up in a vitamin store. On sale two bottles for twelve bucks. I immediately noticed a difference after just a few uses. It works unbelievably well . It’s a cheap alternative . I won’t use the baking soda peroxide combo anymore. Will definitely continue to use coconut oil and the activated charcoal. Also coconut oil for your hair works nicely.I recommend trying it if you want nice white teeth. How have you seen the results compare to other whitening options? Which brand of activated charcoal do you use, and where do you get it?